First, is letter-writing kit bags. This became my go-to present in 2019. I even created one for myself 🙂 It is super handy to have a little bag in my work bag with all I need to drop a note to someone – including stamps (that seem pretty elusive in the modern world). I made 26 (TWENTY SIX!!!) letter-writing kit bags. That is a lot. I love them, and now have a backlog of bags for gifts. And I made so many I restocked my zipper inventory. I also made two goat-related totes for friends. Goat-related totes are cool. I love the little detail of adding a chain purse. I made 3 carryin’ bags. All of them are noodlehead patterns. I will never work with leather again. Way harder than it should be. 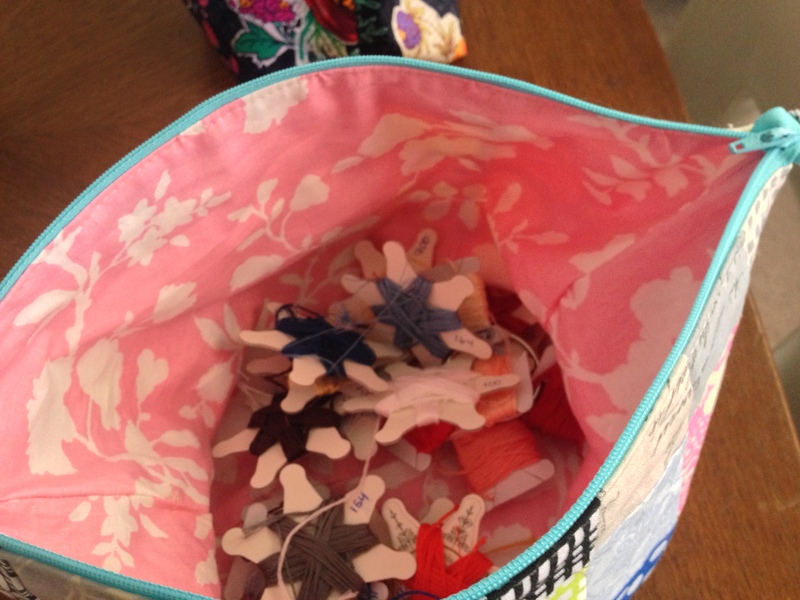 I do love the 241 tote though – I made this one for my mom and am thinking I will make one for myself pretty soon. And I made myself a little needlebook. Because. This Purl Soho tote pattern. 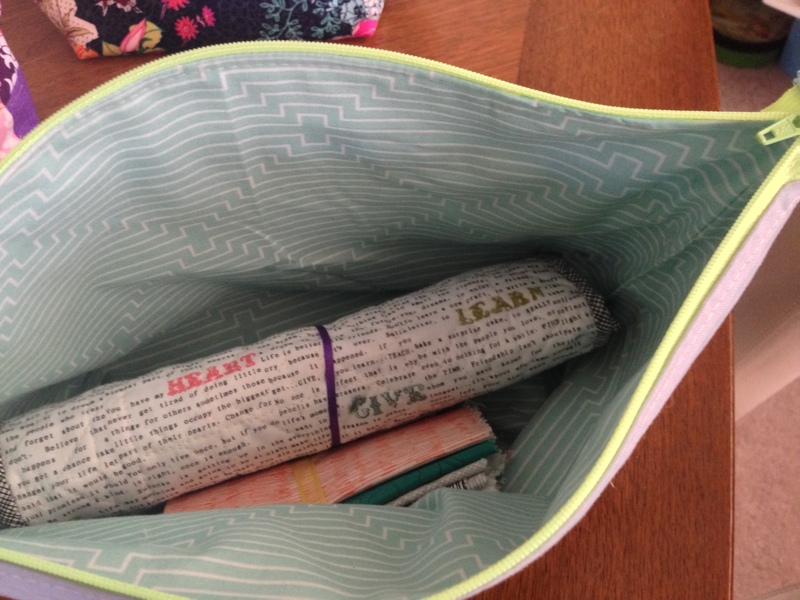 Love, love, love the simplicity and instructions for creating easy to easiest tote. 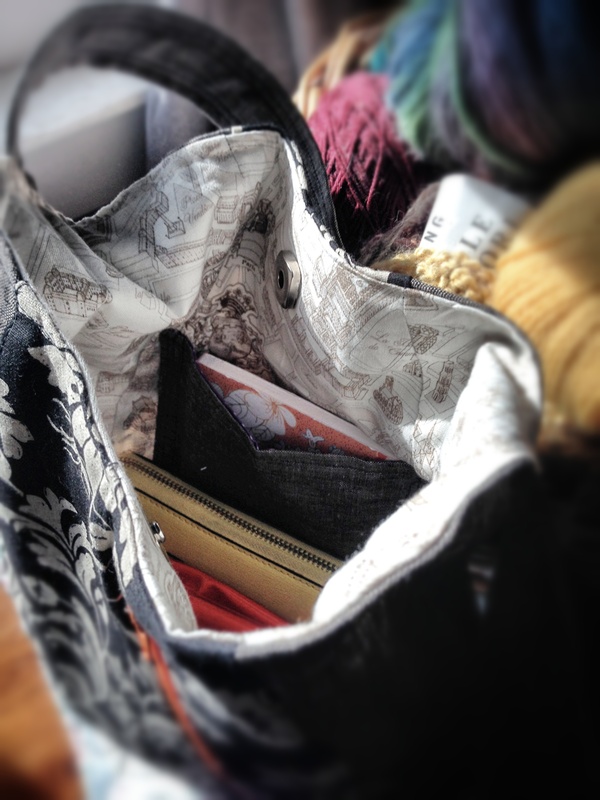 I made the above tote by lining but not boxing. This tutorial for creating a boxed corner in a bag. I HATE the triangle method where you match seams, sew a line and then cut to the seam allowance. So much neater results for me to cut out a square and then sew shut. I wish I could find a triangle seam length to corner size converter so when a pattern tells me how long to sew the seam, I can know what size box to cut instead. Maybe I can try to figure this out myself. Maybe. One of the first things I finished in February was this “Protect your goat” tote. Made for a co-worker who loved this phrase from a podcast she listened to. And I love the sentiment and it was fun to use my Cricut maker and my tote making skills. I made the little coin purse that goes in it as well. So proud of that. I also made a goat-themed tote for a friend for Galentine’s day. 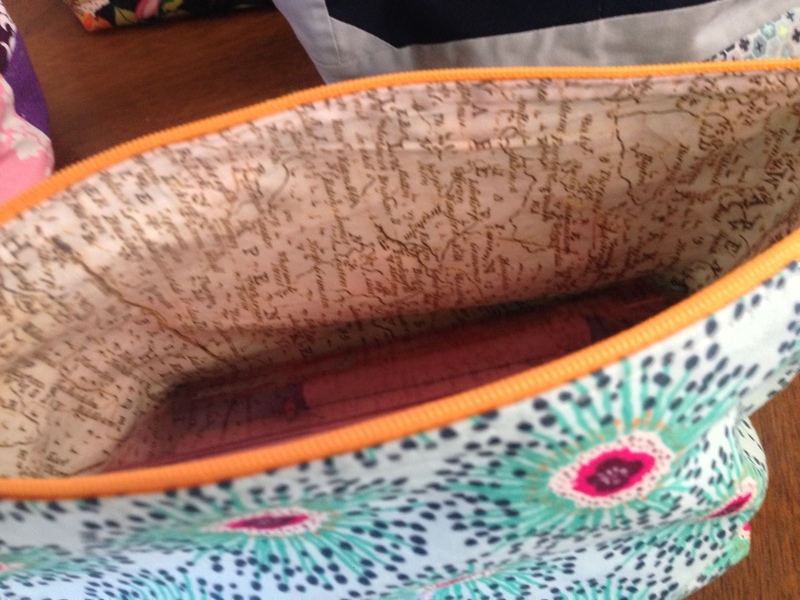 This one I upped the challenge by making the tote lined and making a more complicated little coin purse that was lined and had an outer pocket and snaps and a zipper. Whew!! I love making totes. Want to make one for myself, but am stuck. So much harder to make something for yourself – the decisions seem overwhelming, not fun. I love purl soho too much. The gorgeous projects, colors, materials beckon me to a life that is not mine. Simple, pure, fresh, minimal color palette. My life is full of complications and color and chaos. And that is how I like it – for reals. It started with this bag… the wraparound pocket tote. I love the style of the big pocket on the outside. I made this as a thank-you gift for a woman at work. It was a challenge. I powered through and like what I ended up with, but it was a challenge. And so I made a second of the same tote in the color palette of my life. And I really, really love it. The pattern was a lot easier the second time – and very satisfying to make. And now I have a sea of in-progress purl soho projects. Upper Right: An advent calendar with felt pieces. This one definitely has a deadline. Lower Right: Letters for my niece. This is a wonderful project – making an alphabet using purl soho’s amazing felt (you can’t get stuff like this at Joann). Lower Left: Giant scarf. Lots of tiny, tiny stitches. I love the stitching and I am sure I will love the outcome – but this one probably won’t be ready until next fall. These are just the purl soho WIPs. Too, too many. And so I need to play it as it lays. No more pushing to finish lots. I am going to do my best to enjoy my stitches, delight in each little finish, and try really darn hard not to start anything new and staying off the purl soho website. Wish me luck. The joy of tiny pouches! Several people at work have supported me as I have had some struggles this year – picking up the slack and providing laughs and hugs as needed. I made some ruffle bags based on this tutorial as thank yous. I did these all on one wonderful Sunday of pure joy. The focus of working on these was really healing. These are at a level that is achievable, but still stimulating. And seeing the result in all the different colors was hella fun. 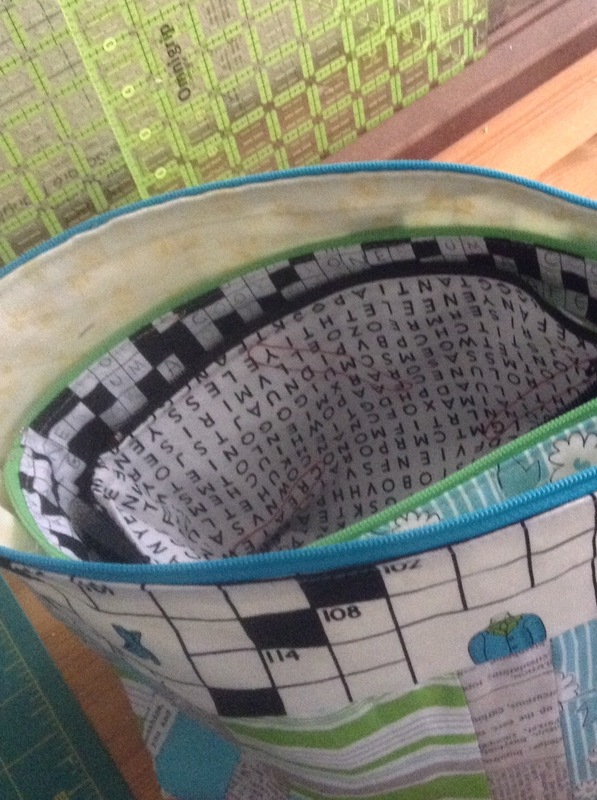 I made a pouch for my MIL last year that had a crossword puzzle pattern on the interior fabric. She really loved it. It was a kick to see how much she got a kick out of that fabric. And I had a lot of various puzzle fabrics in my stash from a whimsical fabric buy. And so I decided I wanted to make her a set of Noodlehead open wide pouches for Christmas. I tried to make one of these in February of last year and it was a disaster. These requiring boxing corners. I hate boxing corners. And I am bad at it. And it required a zipper. I was bad at zippers at the time. Having conquered zippers and having an awesome new sewing machine, I thought it would be ok and try these bags again. I didn’t have enough fabric for the whole outside of the biggest pouch. So, well, duh, patchwork, right? Loved them so much! Love how they look… love the pattern… love the proces. EXCEPT for boxing the corners. I remembered from making the Noodlehead poolside tote, that the pattern had little squares cut out of the bottom corners, making the boxed corners in that bag super simple. So I boxed only one corner per bag, measured how big that square was, and now I can make these pouches by just cutting out the square and then matching up the edges. SO MUCH EASIER. (for reference large = 2.5″, medium = 2.25″, small = 2″ for a 1/.2 inch seam allowance). I loved working in this color scheme, and loved the puzzle fabrics. And my MIL loved them too. She does a lot of handwork, so pouches, especially pouches that open wide, are useful. Although she may have enough now. After making these, I was hooked. 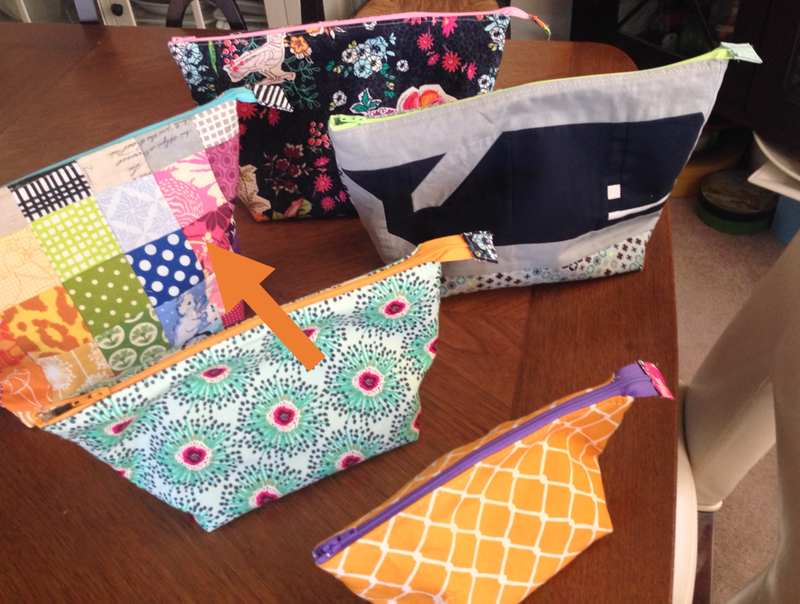 Next up was a large wide open pouch for my schnitzel and boo partner featuring Preppy the Whale. 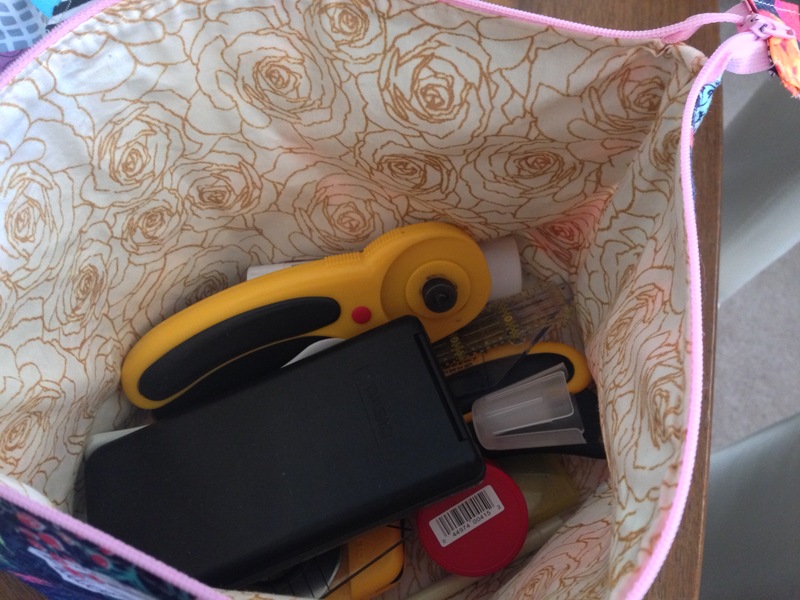 Preppy was fun to put together… and fit the bag width pretty well. I like this block because it looks like the accuracy of paperpiecing but isn’t paperpieced. woot. I paired with fabric from the Tula Pink Saltwater line. 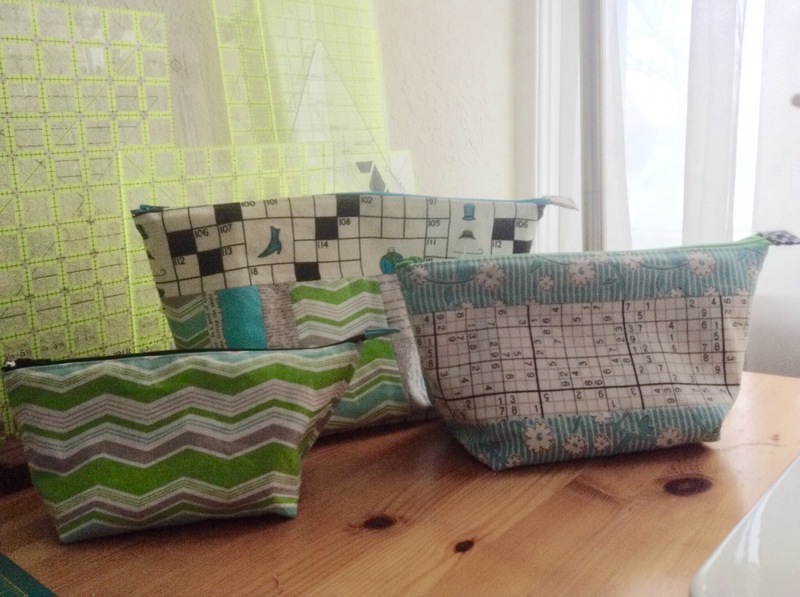 I have had this fabric for a while – and this was a good project for it. I used this cool blue print from the Joel Dewberry Birch line. A good blue that lives between baby and aqua. Matched well. The pouch has the wee quilt and will get a few more goodies before it is sent away. So then I really wanted some pouches for myself. I have been really good about not buying fabric without a specific use. Except for I bought some of all of the entire line of Priory Square. Loved every single print in this line. Beautiful bright florals and da-bomb low volume. And that chainlink fence print. I am bonkers for that fabric. I have lived in a house with chain link fence for a long time – love this simple fencing made it into such a pretty fabric – so evocative for me. 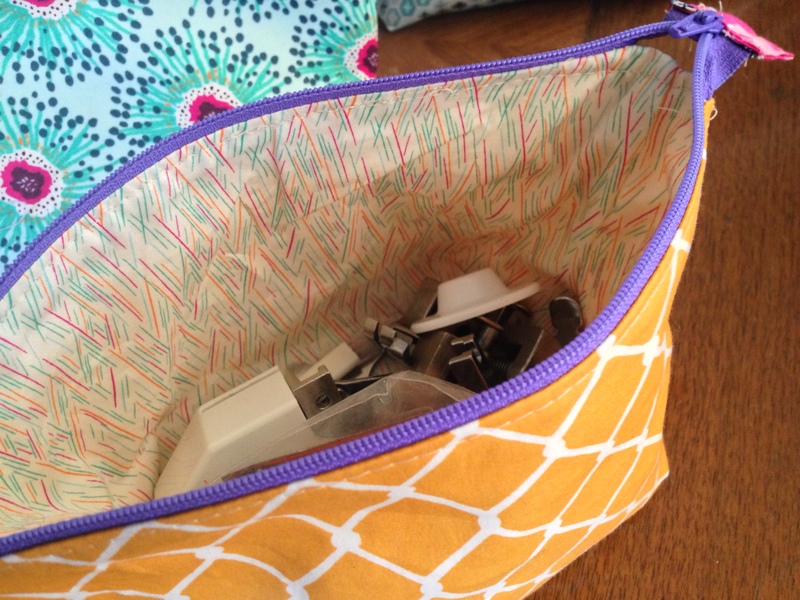 I used this on the smallest pouch because I knew I would use this pouch the most – it has my sewing machine feet and needles. So last up… wow, that is a lot of pouches… is my rainbow cross-stitch pouch. I have been using a wonky three-zipper pouch that was hideous and hard to use for finding skeins of floss. I was so over that bag. And I love cross-stitch. And I love rainbows. So much. I don’t like working with scraps a whole bunch, but totally worth it for this rainbowy goodness. And it is easy to find everything I need. OPEN WIDE! I used a precious Jennifer Paganelli print from Joann for the interior. Earlier this year I made a cute 241 tote that I ended up never carrying (pattern here). Really just a bit too cute for me to feel comfortable with it in public. So last weekend I decided to bite the bullet and make a new one. I love the style, but the last one was a lot of work for my burgeoning skills. Several episodes of The Good Wife and voila! It was done. Much easier than I remember, most likely due to the awesomeness of my new sewing machine. I used Echino (Gothic) which is stunning. And some dark grey-brown linen that I love. 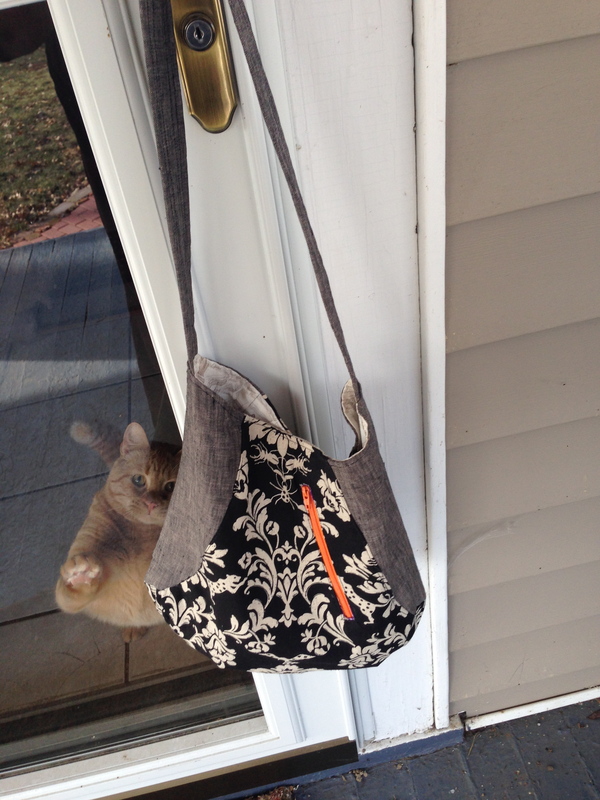 Look at how much George the Cat loves this bag!! I skipped the exterior pockets and stuck with one zippered pocket – I think that makes the tote look a bit punk rock – especially with the bright orange zipper. Those diagonal zippered pockets are design genius by the reliably genius Ms. Anna Graham. The interior is a quilting cotton print of a Parisian street map. So love this fabric. This tote is much more sophisticated, yet still notable for its adorableness. I am not sure this will be the last 241 Tote I make. I would love to make one for a friend or two and for my mom. But not today. Linking up with Crazy Mom Quilts for Finish It Friday! Woot woot.